The "dinosaur rush" that followed was fueled by a rivalry between E.D. Cope of Philadelphia and O.C. Marsh from Yale University, two famous paleontologists who competed to discover and name the most dinosaurs. Numerous sites, mostly in Colorado (Morrison, Canon City) and Wyoming (Como Bluff, Bone Cabin Quarry, Howe Quarry) yielded abundant remains of Jurassic dinosaurs during the closing decades of the nineteenth century. Utah, however, remained out of the picture, until Douglass' fateful discovery in August of 1909. Along a hogback (a ridge formed from steeply tilted strata) near Split Mountain, Douglass found a series of eight large vertebrae (backbones) weathering out of a resistant sandstone layer of Morrison Formation. These vertebrae were from the tail of the sauropod dinosaur Apatosaurus, and would prove to be part one of the most complete skeletons of Apatosaurus ever discovered. More importantly, this site would also prove to be probably the most prolific dinosaur quarry of the Morrison Formation. Douglass conducted excavations at the site, known as the Carnegie Quarry, for about the next fifteen years. Most of these collections were made for the Carnegie Museum, but the Smithsonian Institution and the University of Utah also received material from the site. Dynamite was often needed to blast through the overlying rock layers, and over 350 tons of fossil material was shipped back to the Carnegie Museum. Among the important specimens collected during this period are a number of nearly complete skeletons, including those on display at the Carnegie Museum. The juvenile Camarasaurus is the most complete sauropod ever found. A cast of this spectacular specimen has been returned to Dinosaur National Monument to be exhibited at the Quarry Visitor Center. The dinosaurs that have been excavated from the site include the plant-eating sauropods Apatosaurus (also known as Brontosaurus), Camarasaurus, Diplodocus, and Barosaurus; the meat-eating theropods Allosaurus, Ceratosaurus, and Torvosaurus; and the plant-eating ornithischians Camptosaurus, Dryosaurus, and Stegosaurus. In addition to the dinosaurs, the quarry has yielded the remains of two kinds of crocodiles, two kinds of turtles, a frog, freshwater clams (Unio), and fossil plant material. The quarry site was declared a National Monument in 1915. During the 1930's, a WPA (Works Progress Administration) project expanded the quarry face, but no new fossils were exposed or excavated. The monument boundaries were expanded in 1938 from the original 80-acre tract surrounding the dinosaur quarry in Utah, to its present extent of over 200,000 acres in Utah and Colorado, encompassing the spectacular canyons of the Green and Yampa Rivers. In addition to its dinosaurs, the National Park Service manages and protects a variety of other natural and cultural resources within these expanded boundaries. The Yampa River is the last major tributary of the entire Upper Colorado River Drainage that has not been dammed, and the river system is home to a number of endangered fish species, including the Colorado squawfish and humpback chub. For visitors to the monument, only the dinosaur quarry itself exceeds whitewater rafting in popularity. the scenery, geology, and the plants and animals that make up the natural environment or ecosystem, are also important resources. Paleontological resources are not restricted to the quarry site. Other Morrison Formation sites have yielded the remains of a variety of plants and animals, including frogs, salamanders, and mammals and have given scientists a better picture of the total Morrison ecosystem. Fossils have been found in many of the other formations exposed in the monument as well. Cultural resources include Paleo-Indian sites that indicate the area was inhabited as early as 7,000 B.C. Abundant rock art and other archaeological sites are derived from the Fremont Indians, who inhabited the area approximately 1,000 years ago. Historic sites include the Ruple Ranch in Island Park, the Josie Morris Cabin near the dinosaur quarry, and Pool Ranch in Echo Park. 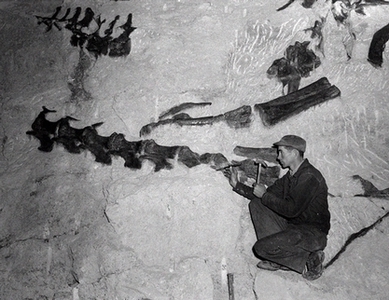 In 1953 Dr. Theodore "Doc" White was hired as Dinosaur National Monument's first paleontologist. With his staff of fossil preparators, the permanent quarry exhibit that visitors see today was created. The visitors center, completed in 1958, was built with the quarry face as one wall. Nearly 2,000 bones are exposed in place on the quarry face inside the visitors center. In addition to enclosing the dinosaur quarry, the visitor center also houses a preparation laboratory, research facilities, a bookstore, and additional exhibits about the monument and its dinosaurs. Current park paleontologist Dan Chure has directed the monument's scientific programs since 1979. For more than twenty years, fossil preparators Jim Adams and Tobe Wilkins were almost as permanent a part of the quarry exhibit as the dinosaurs themselves as they worked to expose the fossil bones in place. During this period the only specimens to be removed from the quarry were those whose scientific importance warranted detailed examination, such as the baby Stegosaurus bones excavated in 1977. In recent years the focus of work has moved away from the cliff face and turned to other sites in the monument. Preparators may be seen on the cliff face during the busy summer months, but more often their work involves excavation and preparation of material from other Morrison sites. These may be other dinosaur sites, yielding important data not found at the main quarry, such as the recent discovery of an embryonic Camptosaurus; however, at least as important are new discoveries of other taxa such as frogs, salamanders, mammals, and plant fossils that give scientists a better understanding of the total Morrison ecosystem. See: Linda West and Dan Chure, Dinosaur, The Dinosaur National Monument Quarry. Jensen, Utah: Dinosaur Nature Association, 1984. Mark W.T. Harvey, "Utah, the National Park Service, and Dinosaur National Monument, 1909-1956," Utah Historical Quarterly, Summer 1991, pp. 243-263.